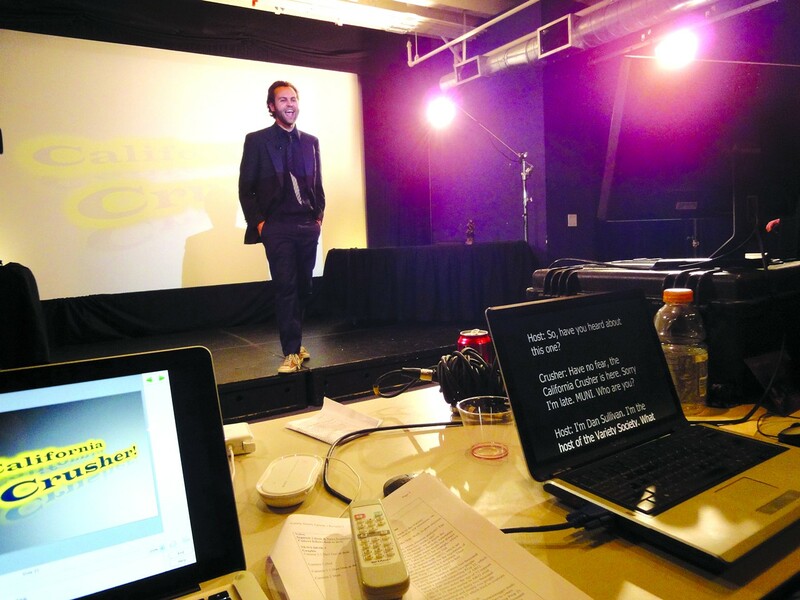 Local variety show aims to bring real diversity back to late-night programming. Dan Sullivan hosts The Variety Society, which hopes to get picked up by a local TV affiliate. Despite the abundance of late-night talk shows on television these days, there's surprisingly little variety. Most are comedy-oriented and feature celebrity guests and live-music performances. Sometimes everyday folks are invited to do stunts, show off their pets, or demonstrate their ignorance of current events. Thus, calling them "variety shows" is somewhat of an oxymoron. At least that's what the creators of the The Variety Society believe. Started last fall and run by a cadre of volunteers and interns, the program aims to shake up the predictability of contemporary variety shows by featuring unusual guests and underground talent, all within the spirit of improv. Its tagline is "21st Century Comedy." "Every time I watched late-night, I saw the same kinds of guests: actors, comedians, singers," said Justin Lanelutter, the show's head writer. "We really wanted to experiment with conventions. Break the rules. Reimagine. Also, deliver the goods in terms of talents and acts." Past shows have booked guests like local adventurist and journalist Joshua Davis to discuss his writing on topics such as drug addiction, sumo wrestling, and salvaging ships for Wired Magazine. In the fourth episode of The Variety Society, filmmaker Wendy Borman discussed her documentary, The Eyes of Thailand, about an elephant hospital working to create prosthetic limbs for elephants that have fallen victim to landmines in Southeast Asia. Local rappers The Dime and improv troupe Piano Fight have also made appearances. Lanelutter says that they try to devote the middle part of each show to a nonprofit or "someone with a mission or a message." Which isn't to say that The Variety Society doesn't have elements of traditional late-night programming. One episode featured the wrestler California Crusher, who riffs on classic Eighties characters and who played an integral part in an operatic story line centered around a struggle for control of the hosting spot. The same episode featured magician David Blatter, musician Todd Shipley, and a beer pong skit examining the meaninglessness of existence. Co-host Marcus Sams interrupted nearly every segment. It was, in a word, variety. Most of the show's team has experience in improv, which helps create a seamless transition between the scripted and less-than-scripted segments. The line between the two is somewhat blurry because they're all playing characters who share their real names: Dan Sullivan plays the host Dan Sullivan, Marcus Sams plays the co-host Marcus Sams. The co-anchor, Alexia Staniotes, is played by Alexia Staniotes. The show's announcer, Erik Braa, is also a scripted character, written into the ongoing story line. The exception is Sam Jack, who plays the California Crusher. Improvised wrestling segments and documentaries on elephants and land mines might never have been combined into one program had it not been for a chance meeting in early-2010 between director Colin Murray and host Sullivan. The two discovered they had a common professional network: Sullivan was working in improv and Murray was a director. The two started talking and hit on the idea of a late-night talk show. By August, multiple brainstorming sessions had developed into a solid idea for what was to become The Variety Society. By October, the team was shooting B-roll. By November, they produced their first show. 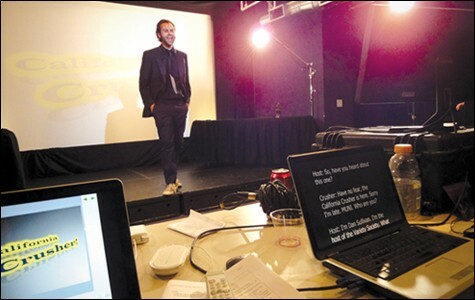 Since then, the team has produced one sixty-minute program, filmed before a live studio audience, per month. Its fifth episode will be filmed on April 30 in San Francisco. The team's ultimate goal is to get sponsors, get noticed, and get picked up. But the show's producers aren't looking for corporate sponsors. Both Murray and Jack (who is the executive producer of The Variety Society) are co-owners of Viral Media Network, an advertising agency with an emphasis on web-ready content. They hope to seamlessly integrate sponsor requests into the programming, and work with sponsors to generate viral content and create web exclusives. Right now, the team is funding the project out-of-pocket. Eventually, they hope to bring The Variety Society to a local television affiliate. But they understand the task will be difficult. "You don't just get to have someone pay money and shoot a pilot anymore," said Lanelutter. "First, you have to get a following and prove that people are interested, and then you get picked up." They're currently in talks with the local independent station KOFY to air the program as part of a "viewer's choice" contest slated to begin in May. The winner of the contest will then likely end up with a slot in KOFY's programming. To generate and maintain interest, the producers of The Variety Society have leveraged the low-cost distribution platform of the Internet, and they've seen a steady growth of viewership across online channels like YouTube and Vimeo, as well as through an active blog and Facebook presence. Segments of the show are posted on Facebook, and entire shows are on The Variety Society's web site and YouTube page. Each show costs just under a $1,000, which is a fraction of what it would cost if there weren't so many people contributing their time and energy for free. A dedicated team of twenty to thirty volunteers and interns, found mostly through Facebook and Craigslist, make the show possible. Jack estimates that paying everyone would cost $10,000 a show, which is well above their ability to pay out of pocket. Still, the unpaid efforts of the team run the gamut from highly skilled camera work and stage management to ticket taking and bar tending in the lobby (which sells cans of Tecate for $2 apiece). "I knew this thing was legitimate when I got a phone call from someone I didn't know, saying they were from The Variety Society," said Sams. "They asked if I needed anything before the show." "I wanted to ask for a pound of bacon, fresh cooked." That may not be such a far-fetched idea, with the possibility of the KOFY deal and viewership on the rise. "We want it to go national, bigger than just the Bay," said Lanelutter. "Late-night has gotten a bit stale, and we want to make it better. And we want to go wide, to national syndication, like Ellen or Dr. Oz." Let's hope they'll continue to sell $2 Tecates in the lobby. Editor's Note: This story has been edited to reflect the corrections mentioned below.